Nylon HD wheels are extra-heavy duty - as strong as steel. Able to bear loads up to 10,000 lbs and will not chunk or separate under load. Resilient to bearing and friction heating. 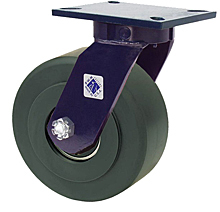 Smooth rolling and forgiving to floors that steel or iron wheels may damage. They do not chunk or separate under extreme applications. They are resilient against high temperature buildup from bearings and friction.